Yes, I am one of those crazy women who you’ll spot wearing a sheet mask mid-flight. And guess what? I couldn’t care less how silly I look because I know I’ll deboard glowing. Step 1: Remove Makeup – Since liquids are a pain to get through security, I opt for Earth Therapeutics K-aesthetics Facial Wipes, which not only remove makeup but offer added benefits like a retinol boost, Tea Tree treatment, or collagen infusion. Read my previous review of these wipes HERE. 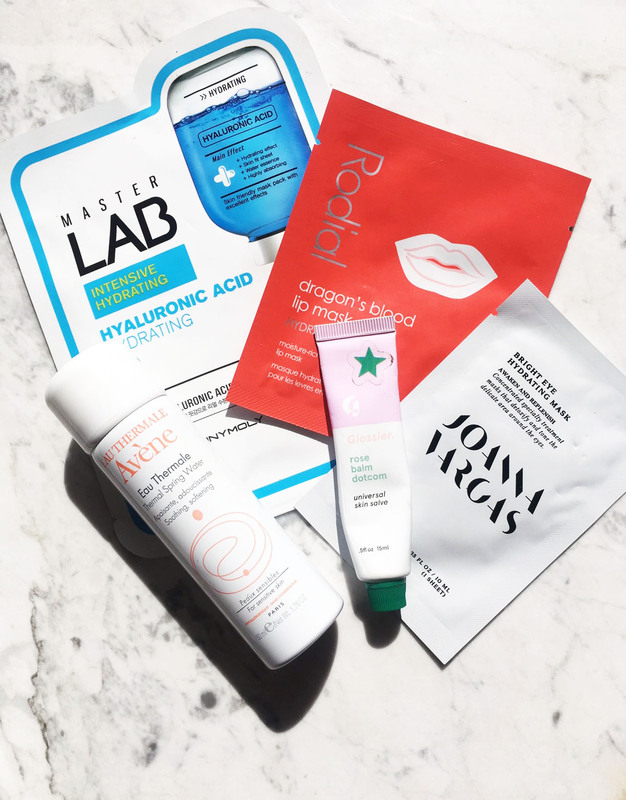 Step 2: Apply Sheet Mask – Since flights are incredibly drying, I opt for the Master Lab Hyaluronic Acid Hydrating Sheet Mask to infuse my skin with moisture serum. Tip: There is always enough leftover in the pouch for a second application (using your hands) the following day. Step 3: Apply Lip & Under-Eye Masks – Your lips and under-eyes are just as important as the rest of your skin! To combat the chap, use the Rodial Dragon’s Blood Lip Mask to soothe and protect, adding intense hydration with Hyalruonic Acid and Glycerin. For my eyes, I swear by Joanna Vargas Bright Eye Firming Mask filled with Matrixyl 3000, known for its ability to repair and heal the skin and boost collagen production combined with algae extract for hydration. Because I only get 1 carry-on bag and it isn’t going to be the one under my eye! Step 4: Refresh – Throughout the flight I spritz Avène Thermal Spring Water when I feel my skin tightening and drying and slather on Glossier Balm Dot Com across my lips. Read more about this best-seller HERE.